The Animal Health Company Classic is a unique event in the dog Agility world with all three Kennel Club heights of dog competing against each other. Regional heats were held around the country from early spring and our finalists were invited to celebrate their achievement at the autumn Animal Health Company Celebrations. With morning classes open to all finalists and their connections to acclimatise their dogs to the surrondings, for many this would be the first indoor show of the winter season. The arrival bacon rolls ensured all were well set up for the day. With the course for the final built, it was time for lunch courtesy of the Animal Health Company thus allowing the finalists a good time to plan their strategy for their final run with dogs running in Small, Medium and then Large dog order. This hospitality is unique to them and we am sure was truly appreciated by all finalists. This is an event I have previously enjoyed competing in, so I was really honoured to be asked to judge this final. We got every one warmed up with a KC Agility Class, followed by a Special Jumping Class. I set some big, fast and flowing courses and I hope you all enjoyed them. My finals course was another big, fast flowing course, and it was fantastic seeing everyone really go for it. Congratulations to Julie Dunlop with Hillsidejemz Firecracker (Small) for taking the 2018 Animal Health Company Classic title a second quicker than 2nd place Sara Bacon with Tynevermore Torque (Large dog). It was Amy Bennett with Heaven Sent to Mirramay (Small) who took the final spot on the podium. The Animal Health Company Celebrations provided free drinks and food all day for every one attending. Thank you to Animal Health Company for inviting me to judge the Animal Health Classic Final. 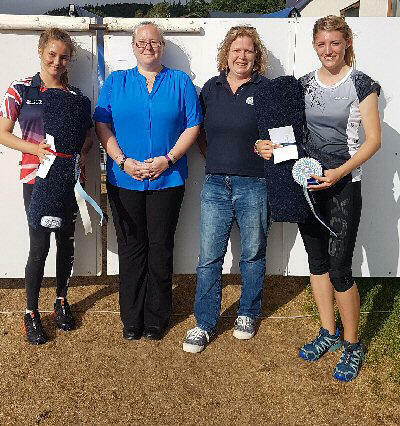 Animal Health Company’s Sales Manager Jennie Westcott said, 'We are delighted to congratulate all our 2018 winners of this Agility competition and hope everyone enjoyed themselves taking part around the country. With our finalists arriving from the south and east coasts, Wales and Manchester, we hope you enjoyed your day, win or lose at the Animal Health Company Celebrations 2018. The Animal Health Company looks forward to meeting you at an Agility show near you. The Animal Health Company offers a range of products that will be ideal for the Agility dog including their new food, Westcotts. Unique to the market it contains HypercCoat Prime our popular supplement. Westcotts it is formulated with high levels of chicken and rice, is hypoallergenic, pro biotic and has no added flavourings or preservatives produced from quality ingredients helping dogs with a sensitive palate. The Animal Health Company website http://www.animal-health.co.uk has all the details. Getting the 2018 agility show season off to a great start is the news that both Agria Pet Insurance and The Animal Health Company will be sponsoring agility sport for another year! The competition is open to all sizes of Agility dogs in a steeplechase style course featuring the Westcotts Water Jump! For The Animal Health Company, this is their fifth year supporting the sport. Their exciting steeple chase competition is a thrilling event that’s unique to the agility world with a course that always includes a bespoke Westcotts Water Jump. With the motto 'Committed to animal care,' The Animal Health Company is well known for producing a leading range of complementary feeds for horses and dogs. The significant and ongoing research the company carries out to produce award-winning products to increase the well-being, comfort and health of animal consumers creates an outstanding contribution to the world of animal healthcare. For ring reports, follow the links. With a day of Animal Health hospitality for our winners, all of whom will need to book Saturday, 24 November 2018 to join us at The Animal Health Company Classic Final which will be judged be Championship Agility Judge Jackie Gardner. With Stratford upon Avon just down the road and a great place for some Christmas shopping so it’s definitely a weekend destination. The Animal Health Company offers a range of products that will be ideal for the Agility dog including their new food, Westcotts. Unique to the market, it contains HypercCoat Prime, a popular supplement. Westcotts it is formulated with high levels of chicken and rice, is hypoallergenic, pro biotic and has no added flavourings or preservatives produced from quality ingredients thus helping dogs with a sensitive palate. Many fields on the way up the A15 to the Scunthorpe Champ show had water lying in them so the arrival of the Westcotts Water Jump for the first of 2018 heats was probably a bit over the top. Well done to all the organisers and everyone connected to the show including the landowners. With a few roadway changes, all the rings and surrounding ground - whilst soft - easily accommodated Scunthopre's 4000+ entries across the weekend. The local Travel Lodge must have thought Christmas had come early with the increase in trade. The fast moving competition, under the watchful eye of judge Doc Doherty, produced it's usual crop of 'if onlys' as well as five successful finalists. Heat 2 see us joining the Hatton Festival where we look forward to finding our next five qualifiers for the 2018 Final. Heat 3 of The Animal Health Company Classic took us to Essex on 19th May where our hosts Stonebridge DTC seem to have found a great venue alongside the Ashfields Carriage and Polo Club. I have no idea why our judge Elaine Hudspeth missed the photo call - although I am told she was seen in the ice cream queue. With all three sizes of Agility dogs able to take part, the course laid influenced the outcome and seems today all our winners were legless afterwards! Congratulations to our finalists and you will need to book Saturday 24 November 2018 in your dairies to join us at the final. More details soon. Heat 4 see us going up North l where we look forward to find our next five qualifiers for the 2018 final. If you have ever been to Matlock Bath, you will know that end of the pier feeling about the place with a range of motorbikes on a sunny evening that would gladden the heart of any enthusiast. Just down the road peace and tranquillity reigned at Cromford where Dog Vegas hosted Heat 5 of the Animal Health Company Classic 2018. Amy Gandy who officiated reported, 'I recently had the privilege of judging qualifying heat of the Animal Health Classic Steeplechase qualifier. It was scheduled at the end of a long hot day for judges, dogs and handlers alike. I set a fast flowing course which meant the dogs could really open up and enjoy running with no tight turns to slow them. The dogs had a blast whilst the handlers only needed to encourage the dogs in the right direction and feel the pressure of trying to qualify themselves. All heights running against each other there was a great variety of dogs taking part. 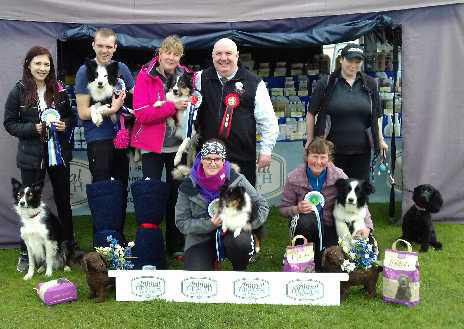 You would think that it was only open for the fast collies to win but, with their reckless speed, poles went flying. Some of the smaller dogs were very quick and accurate too, not wasting even a space inch on their route around the course. It was exciting to judge as you just could not tell whose round was quicker. They were all fantastic! Keeping with the motoring theme, we move to the birthplace of Charles Rolls of Rolls Royce fame where Heat 6 will see us find our next five qualifiers for the 2018 final. Finally we even got Sassy to look at the camera! With the weather in full cooperation, the Wye flood plain provided the backdrop for the Wye Valley DTC Premier Show under the lee of, and within walking distance of Monmouth Town Centre, which hosted this heat of the Animal Health Company Classic 2018. 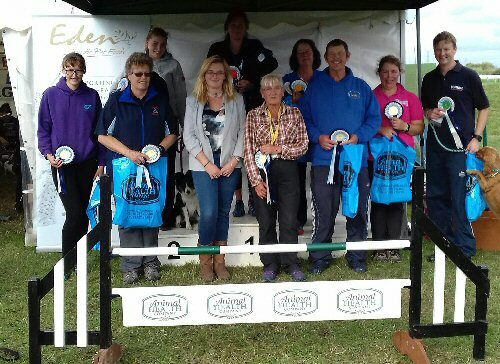 Open only to Small and Medium dogs, 150+ partnerships took up the challenge with judge Richards Ascough's winners today coming from as far away as Cornwall. Returning to England we will cross the country to Peterborough Show ground where Just Dogs Live, a celebration of the dog in many guises where Heat 7 will see us find our next five qualifiers for the 2018 final. For the sharp eyed amongst you, you’ll notice our judge Christine Stratford did not make the photo call. I am sure Just Dogs Live was pleased that Nigel Rudd, Christine’s ring manager was able to step into the presentations breech. Now I only have this second-hand as it were, but it seems some orange fencing 'attacked' Christine on her way to the water tap, resulting in an A& E visit of some hours where they found she had a broken right wrist - perhaps making her 'armless.' Enough! I thoroughly enjoyed my day judging and I hope people enjoyed running my courses. It was a very hot and sunny day and the handlers queued sensibly, keeping their dogs cool and in the shade till called forward by my fantastic ring party. Thanks to our hosts of Heat 6 of the Animal Health Company Classic 2018, we are building a great range of finalists to join us on Saturday 24 November 2018 us at The Animal Health Company Classic Final. Rugby Championship Agility weekend is where Heat 8 will see us find our next five qualifiers for the 2018 final. 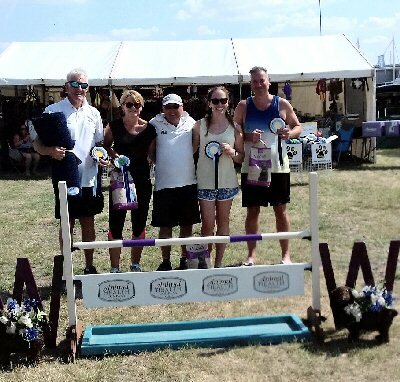 With a day of Animal Health hospitality for our winners with the final kindly judged by Championship Agility Judge Jackie Gardner; Stratford On Avon and Warwick Castle just down the road it all makes a great short break destination. The question was could this weather last? 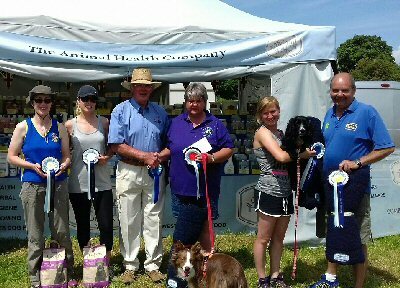 Rugby connections certainly hoped so for their Championship Agility weekend and so it proved as even our winners sought a bit of shade in the Animal Heath Company trade stand. It was too hot for the dogs for the photo call today. Judge Jane James glowed all day as Chipping Norton took over their favourite venue to host, amongst other qualifiers Heat 8 of the 2018 Animal Heath Company Classic. With the competition open to all sizes of dog, it’s often the smaller dogs, with tight turns and bouncy style that hold their own against what maybe perceived the larger striding dog in this competition. 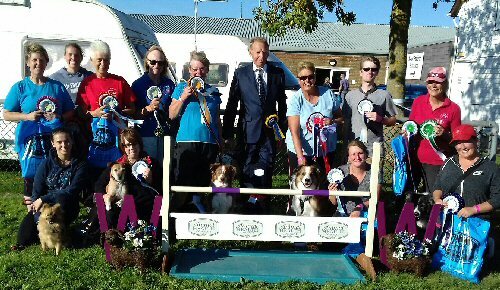 And so a further five finalists join us on Saturday, 24 November 2018 at The Animal Health Company Classic Final kindly judged by Championship Agility Judge Jackie Gardner. There are details about the day on Animal Health Face book page, Agilitynet and from the address below with family, friends and connections very welcome to join you to celebrate your achievement. Pembrokeshire By the Pond is where Heat 9 will see us find our next five qualifiers for the 2018 final. 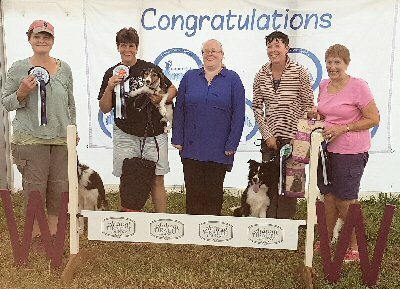 It is true that all sizes of dogs can successfully compete in this competition as a delighted Jackie Travers Spencer proved in front of an enthusiastic County Show crowd. Mimi set the pace and, whilst some came close, neither handler experience nor a previous winner of Welsh Handler of the Year managed to topple her. Thanks to Judge Sam Jackson who joined us especially for the show. Welsh Kennel Club is just around the corner, which will see us find our next five qualifiers for the 2018 final. 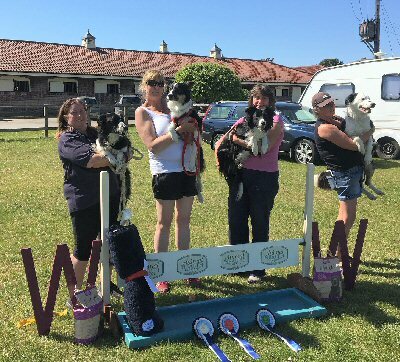 Keeping it Welsh, Judge Sam Jackson joined us and 150+ entrants in Bulith Wells in the heart of the Welsh dog world to find some more qualifiers for the Animal Heath Company Classic. 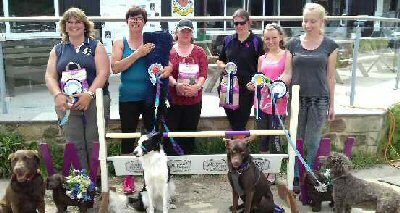 It was success for one of Agility's youngsters , 15-year-old Sara Bacon who also won the Championship Large dog class as well so no doubt she really enjoyed her day. North Derbyshire Championship Agility Show will see us find our penultimate five qualifiers for the 2018 final. There were too many winners to get on the podium photo after Judge Megan Drinkall laid a very fast course for the penultimate chance to qualify for the final of the Animal Health Company Classic. Once again, a Small dog beat all comers in one of the larger heats of the competition. Paws In the Park awaits to find the last five qualifiers for the 2018 Final. Judge Paul Smith in Kent sunshine celebrated his winner's success in the last heat of the 2018 Animal Heath Company Classic. And so the final five finalists will be invited to join us on Saturday 24 November 2018 at The Animal Health Company Classic Final kindly judged by Championship Agility Judge Jackie Gardner.